If you love the moisturizing benefits of co-washing, but find that your scalp tends to itch, break out, or produce dandruff because of the sebum build-up, the Condition-Wash-Condition method is a great alternative. It enables you to give your scalp the cleansing that it needs, while simultaneously providing moisture to parched locks. This method can replace the co-wash in your regimen, or it can be used periodically. and a hair masque or deep conditioner (if desired). This method works on all curl types, but If you have tighter curls and coils, and/or longer hair that tends to knot easily, you may find that adding a pre-pooing step is the best approach for you. 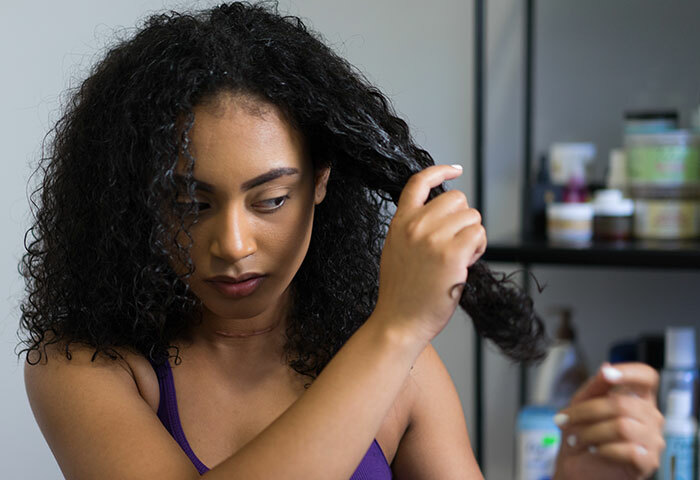 Pre-pooing, or using oils to help detangle your hair before shampooing, can reduce breakage and excessive shrinkage--and it can add a little extra moisture and sheen. Working in sections, apply oil to your hair, avoiding your scalp. Detangle, and then twist or clip each section while you work on the rest of your hair. When your hair is completely detangled, start the Condition-Wash-Condition Method at step 2, below, taking each twist out as you apply conditioner. If you have not added a pre-poo step, thoroughly saturate your hair with water. Working in sections, apply a generous amount of conditioner to your hair, starting at the ends and working up the hair shaft. Massage the conditioner into your hair. If your hair is extremely dry, use a masque or deep conditioner for this step, and let it remain for 5-20 minutes before proceeding. Do not rinse out. Now it is time to apply the shampoo. Using a small amount of shampoo, gently massage the scalp. Gradually add more shampoo as needed. Work slowly and carefully. If your scalp is particularly oily, and your hair does not tangle easily, you may want to use a shampoo brush to help distribute the product and exfoliate your scalp. Work the shampoo through to the ends, and then rinse your hair thoroughly, ensuring that both the shampoo and conditioner have been removed. Condition your hair again, starting at the tips and working your way up the hair shaft, smoothing in the conditioner as you go. Ensure that you have reached all your strands. The conditioner you use in this step can be your regular moisturizing conditioner, or a heavier deep conditioner, depending on your preference. However, if you have already deep-conditioned your hair in step two, you should not do it again in this step. Using your fingers, or a wide-toothed comb, gently detangle your hair. If you have thicker hair, or hair that is prone to tangles, work in sections, clipping each section as you go. Rinse thoroughly, either by flipping your head upside down and placing it under the showerhead or faucet, or, if you have a looser curl pattern, by using the Squish to Condish method. Apply your favorite products, and style as you normally would. Have you tried the Condition-Wash-Condition Method? We would love to know how it worked for you. Let us know in the comments. To perfect your Condition-Wash-Condition method on a budget, see: 10 Drugstore Conditioners to Grab Under $10.